Gently unfold pastry and place on parchment paper-lined baking sheet. 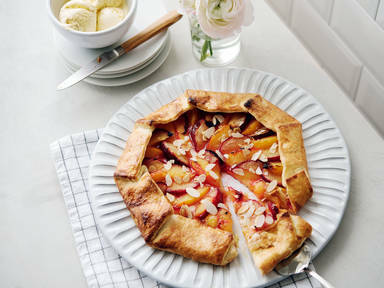 Slice stone fruit and combine with sugar, cornstarch, and lemon juice in medium bowl. Preheat oven to 220°C/425°F. Add fruit mixture to center of pastry leaving a 5 cm/2-in. border. Fold edges of dough over filling to partially cover. Beat the egg and brush it on pastry. Sprinkle galette with remaining sugar. Bake at 220°C/425° F for approx. 20 min., or until crust is golden brown. Toast the almonds and sprinkle them on top. Serve warm or at room temperature with a scoop of ice cream. Enjoy!